In our earlier post we have learned about making connection from a Java program to the databases.But the drawback of just using createStatement() and excuteuery(),is that we can request for run time values and then insert it into the database. To overcome this drawback,there is a special type of statements called as PreparedStatement for inserting the values into the database which are given through command line arguments.These statements are used to insert rows into the database with values given through command line arguments. 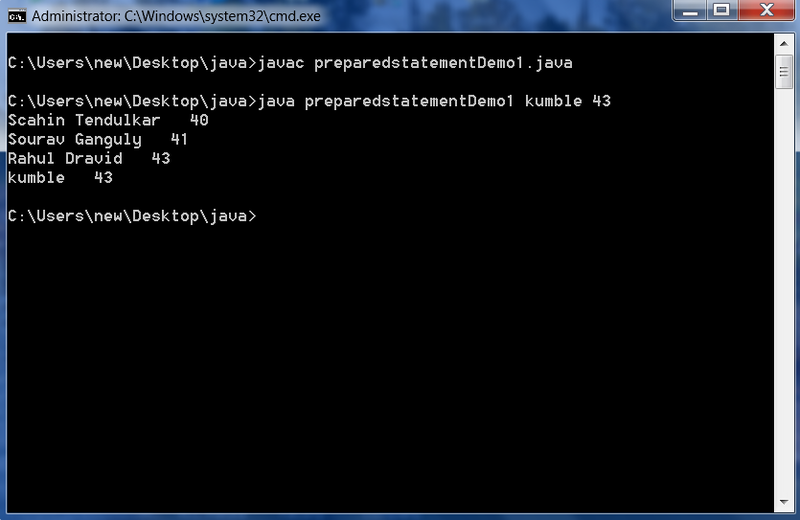 We shall write a program to demonstrate the use of prepared statement. This entry was posted in Java and tagged insert query in java program, insert using preparedstatement in java, preparedstatement java source code, sample code for preparedstatement in java, update using preparedstatement in java, why we use preparedstatement in java. Bookmark the permalink.